It seems like every time we turn around hackers have struck again. Russians, North Koreans, The Chinese…and disaffected youth everywhere are using the Internet to attack networks and servers everywhere. 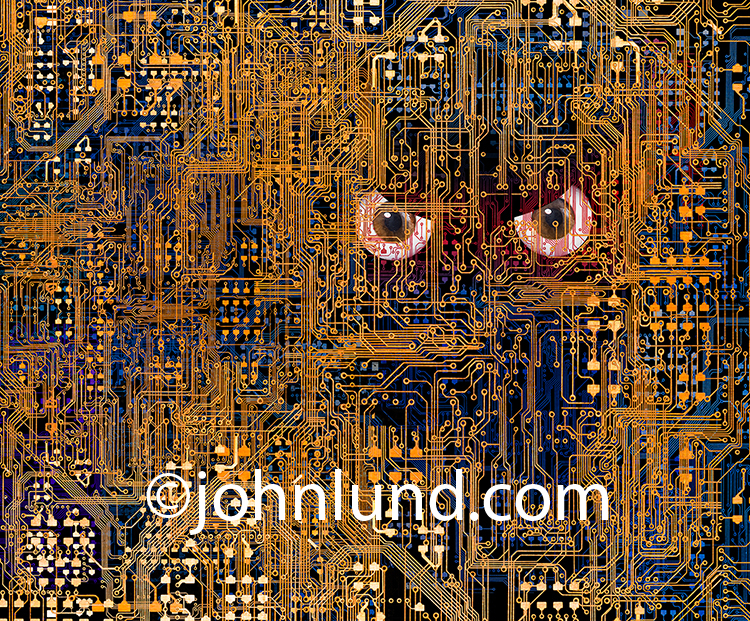 If there was ever a stock photography subject matter ripe for the picking…it is cyber security issues. I managed to get impromptu access to a small server room…so tight I had to press my back into the wall and really scrunch up with my 24-105 lens zoomed all the way out on a Canon 5D MKIV and grab a couple of shots. The background was plywood and cables…not particularly photogenic! I used the pen tool in Photoshop to strip out the servers. I then duplicated the servers and then extended them to create a larger looking line of hardware. I duplicated that set of servers and flipped them and managed to get the look of a much larger server room. I dropped in some cloud images behind the servers, then added a layer mask to the server layer and “painted” out the bottoms of the servers to make it appear as if they were emerging from a cloudscape. By having the servers in clouds we bring in the concept of cloud computing…which be default brings in the concepts of networking, connections, the Internet and big data. Next I went to my archives and found an image I photographed of a hoodie (shot of myself using my self-timer). The hoodie makes a perfect symbol of crime…in this case of hackers and cyber criminals. I stripped out the hoodie using the pen tool to create a clipping path and turned that into selection. I then pasted the hoodie into the image and added a bit of blue-green color to add interest. I created a layer mask of the hoodie and painted away my face from the garment. Finally, I added a couple of layers of binary numbers, ones and zeros, made with the type tool and given perspective with the transform tool. The binary numbers also add to the story line of digital communications, streaming information and, of course, big data. 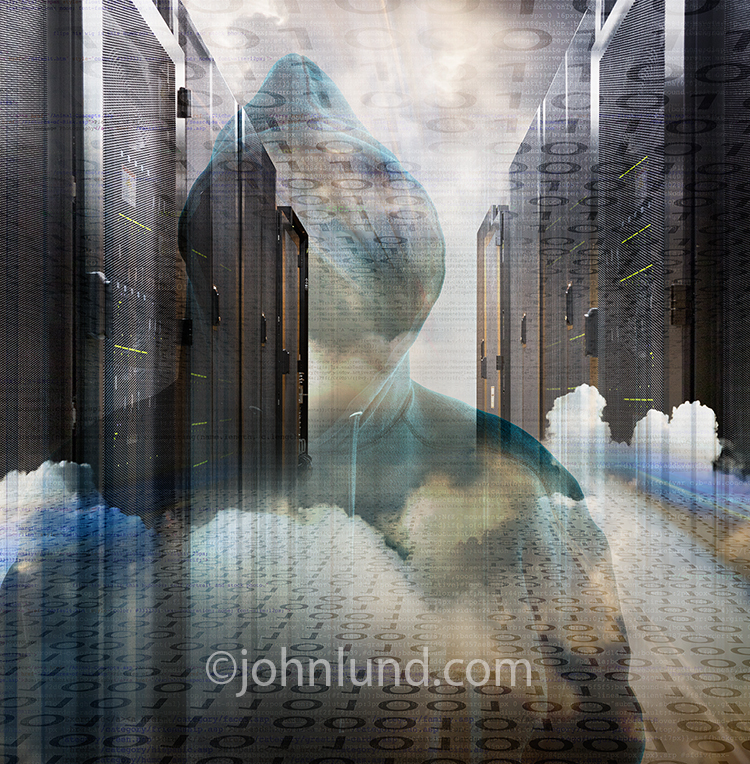 I decided to put this hacker stock photo image with Getty as an RF (royalty free) image figuring with RF there is a bigger audience and these days there is a bountiful need for images dealing with hackers and cyber crime…a need that I think is only to grow as time goes on. A cheetah sprints through a cloudscape in a visual metaphor for fast cloud computing and networking connections. 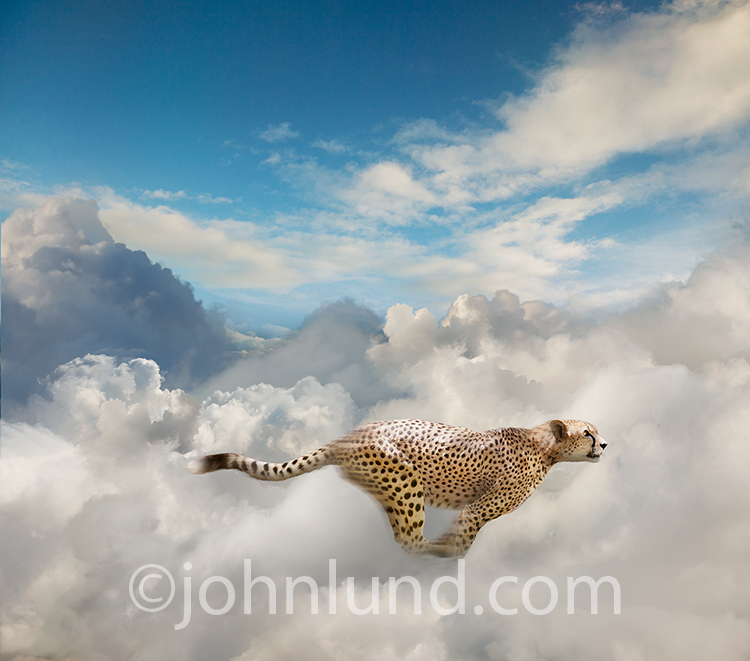 Speed in the cloud, fast connections, and high bandwidth are all concepts illustrated by this Cheetah sprinting through a cloudscape. 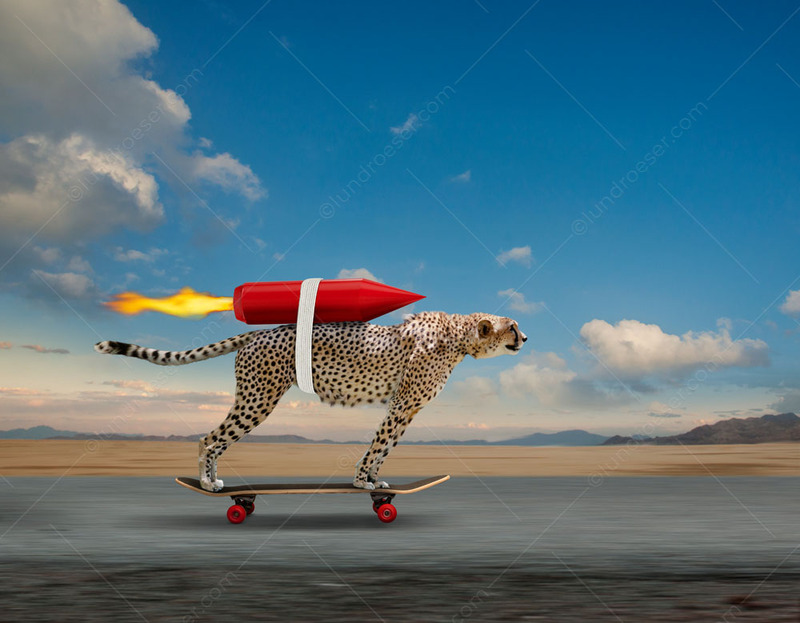 In fact, any aspect of cloud computing, networking and connections that are in need of speed can be effectively illustrated with this Cheetah stock photo. 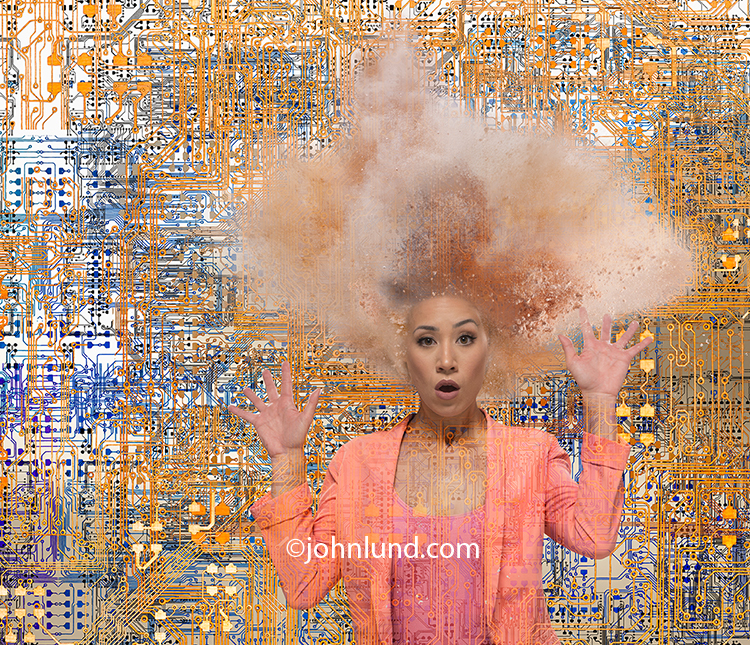 An earmark of a good stock image is it’s ability to illustrate a wide range of ideas…and the element of speed covers a lot of ground…quickly! Cheetahs are THE iconic symbol of speed just as clouds are now a symbol of cloud computing. 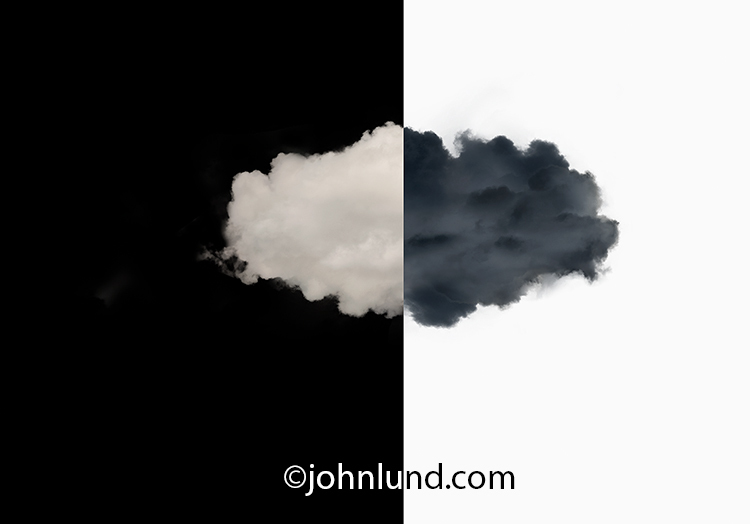 Put the two together and you have a quick-reading clear visual metaphor for speed in cloud computing, fast connections and high-bandwidth networks. To help this image become a best seller I composed it to crop easily to any format and to have ample copy space for the needs of art directors, graphic designers and photo editors for headlines and body copy. I added just a bit of motion blur to the fast cat to add a sense of movement…something that often helps an image sell better. Another plus for the image is in the fact that the image is not one we’ve seen before. I did a considerable number of searches, both in stock agencies and online…and did not find any other images of a cheetah sprinting through a cloudscape. Put that symbol of speed (the cheetah) into an unexpected environment and you really increase the chances of grabbing a viewer’s attention and creating a lasting memory of the image and message behind it. 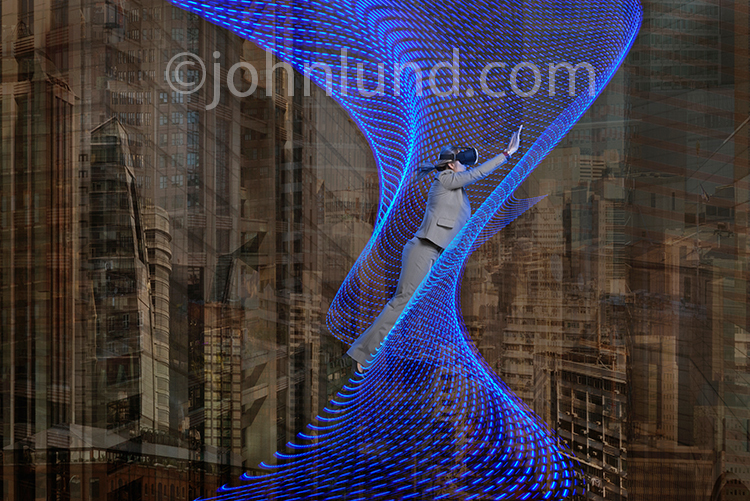 I uploaded the image to Getty as a Rights Managed image. 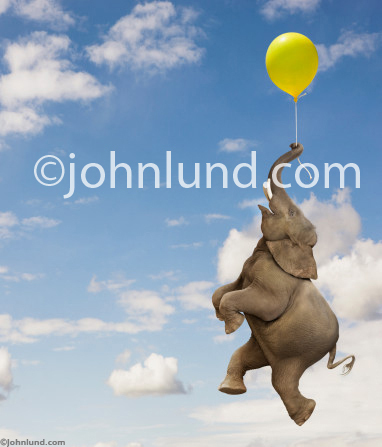 I chose RM because the image is hard to duplicate (most photographers don’t have the cloud and cheetah raw materials) and I think is well suited to print campaigns. But my hope is to make a few large sales as opposed to a bunch of small ones. We shall see. Despite the fast subject matter it will probably be six months to a year until I find out if the image is successful. 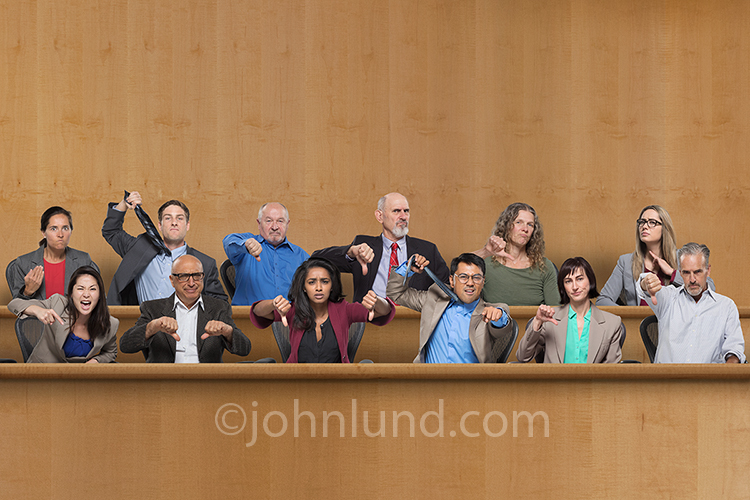 It still seems to take that long before most of my images hit their stride…so to speak. Need to know the future? Where better to go than a Gypsy fortune teller cat and her trusty glowing crystal ball...a stock photo created for advertising and greeting card use. If there is anything that everyone wants to know it is the future. 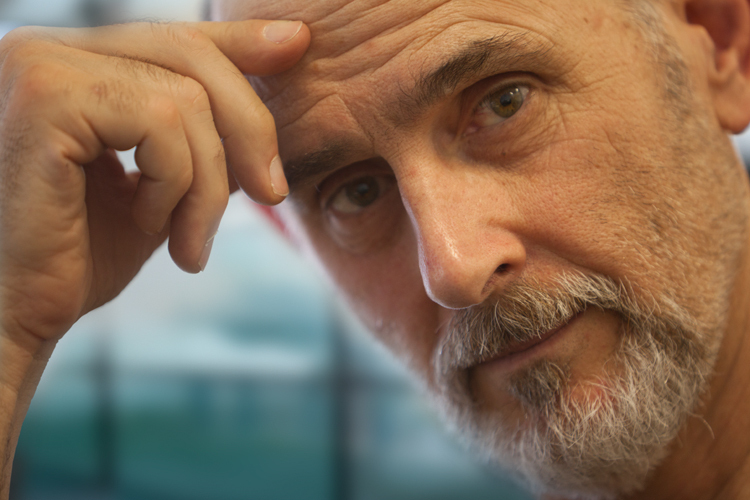 What does the future hold for us, and for our business? Knowing what the future holds is the ultimate advantage. And what is the iconic symbol for the key to the future? The fortune teller of course, and her trusty crystal ball. In fact, a Gypsy fortune teller, hovering over a crystal ball, is an image we all ingrained in our collective consciousness. It stands to reason then that a well-crafted stock photo of a gypsy fortune teller, crystal ball and all, could find a hefty market…and help a stock photographer make at least a step towards their own fortune. 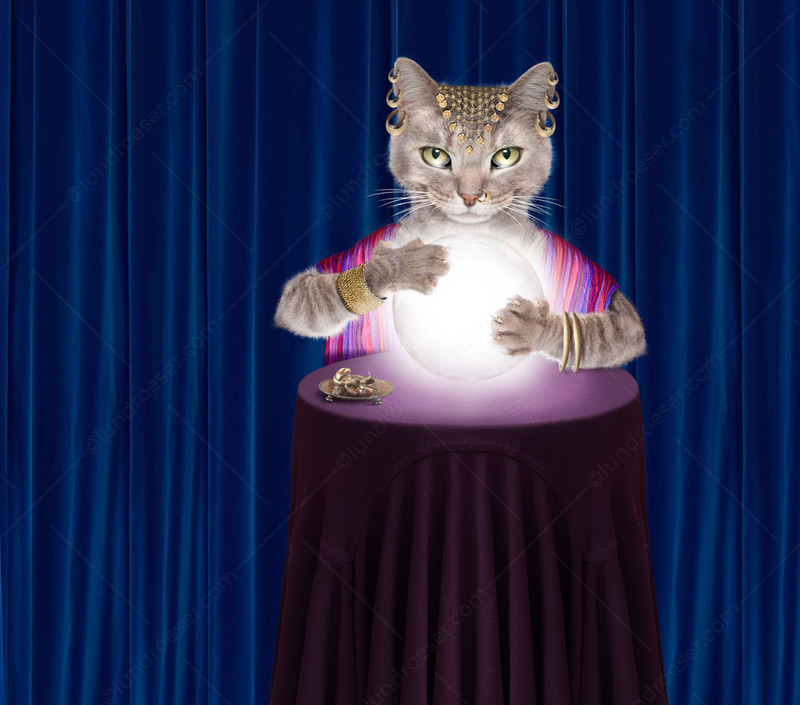 With this in mind my partner Stephanie D. Roeser, set about to create not just any fortune teller stock photo, but an image of a feline fortune teller. Not an easy task when you think about the anatomical challenges of fitting a cat to a human pose…and the fact that cats don’t tend to wear earrings, nose rings, bracelets or other such adornments. To actually create the prognosticator of the future Stephanie went to our archives for the cat imagery and crystal ball photo and background curtain. She set up the table, which we shot (using our trusty Canon 5D MKIV camera), as well as the various articles of jewelry and the vibrantly colored scarf or shawl. 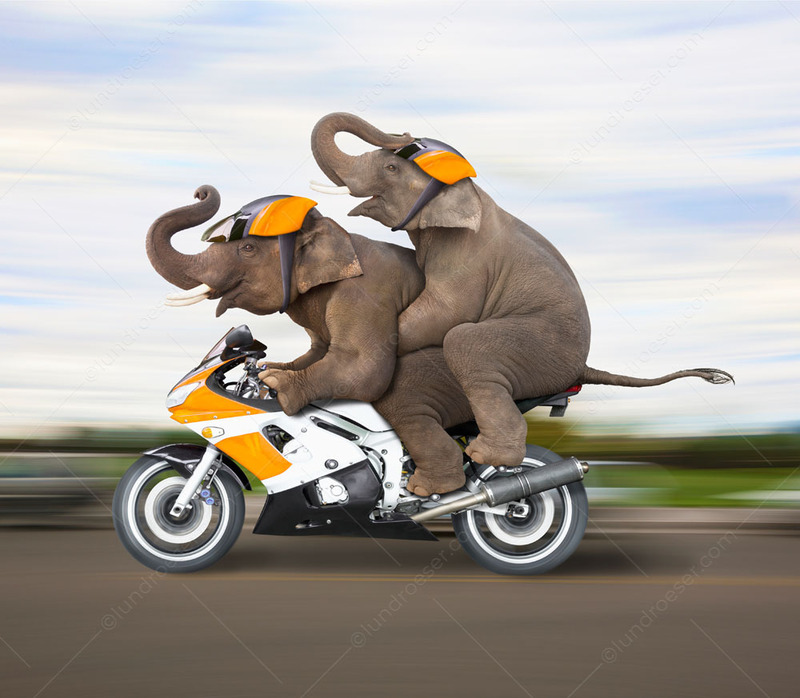 When putting these funny animal stock images together you never know what challenges are going to pop up. In this case none of the cat shots we had that worked the best for this pose included any good “eye” photos. Stephanie did find a different, not quite as good-looking cat, that had perfect eyes for this image. It even looked like the cat had eyeliner on! It takes meticulous work to strip out hair and fur, but Stephanie did a stellar job…as you can see. And for the eyes…talk about eye contact…there is a powerful connection between cat and viewer. Stephanie even managed to make the cat appear to be primarily lit by the glow from the crystal ball. The attention to detail is one of the things that sets Stephanie’s work apart. This funny cat photo was created as a stock image and as a humorous greeting card photo. The image was crafted, as such, to be easily cropped to square, vertical or horizontal formats with plenty of copy space for text, captions, etc. BTW, blue is the color most associated with business, so adding the blue curtain in the background makes the image just a bit better for business uses to. What Stephanie has created is an image that draws on the power of iconic symbols, gypsy fortune tellers and crystal balls, adds the impact of using a cat as the gypsy…a twist that further adds to the impact of the symbols, and appeals strongly to any cat lovers. 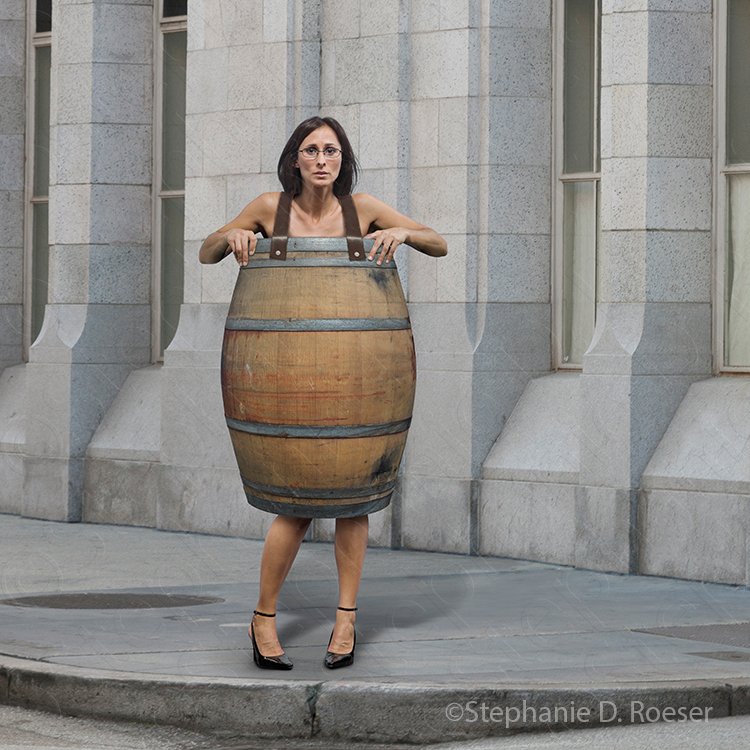 I am predicting a profitable future for this stock image!